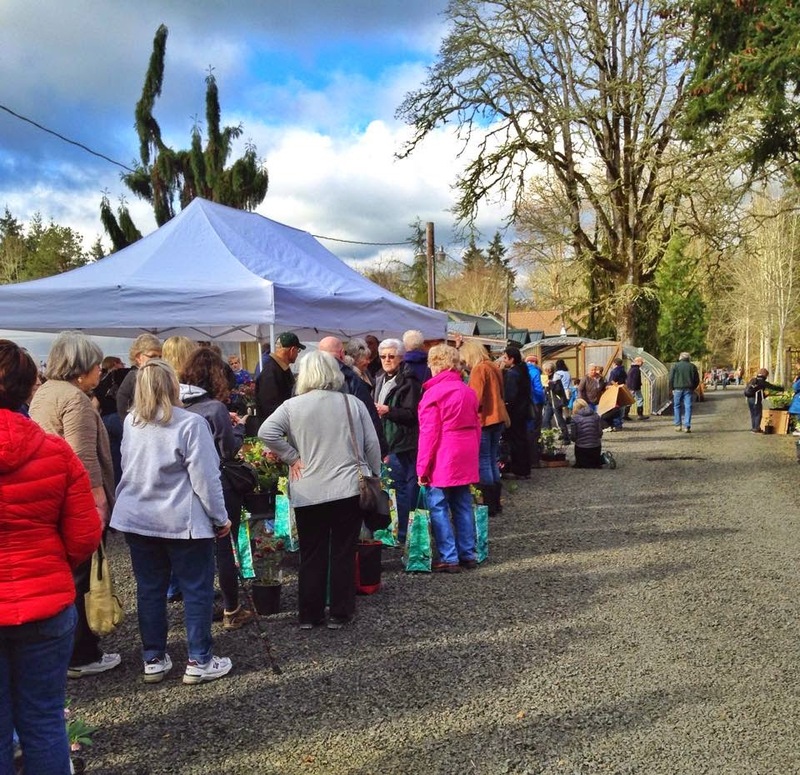 After many years of feeling blue that I could not attend...I finally made my way to Eugene, Oregon for Northwest Garden Nursery's Open Garden and Plant Sale....the Hellebore Mecca of Oregon. I had a plan. I knew from Danger Garden's experience at the sale last year, that I had to get to the sale early. I'd heard tale that the sale would sell out within the first hour. WHAT?? It literally sold out with in the first hour. I was there at the opening gate and it was a frenzy in the greenhouse. I quickly scooped up plants that I had eye'd from the website and stuffed them into my fabric grocery bags (note...bring an easy way to haul your goods...the fabric bags worked like a charm) and made a round through the greenhouse and got out...alive. Then, my shopping companion, (my kids' Nana) needed a another plant, so I overcame my crowd anxiety and dove back in to find the treasure. Here is what the check out line looked like. The sale started at 10am and this is probably 10:20am. I was so tickled with my pretty plants. I really enjoy growing hellebores for the cheer they bring in what can otherwise be a drab and gray time of year in the Pacific NW. After we paid and secured our hellebores, Nana and I enjoyed a long, lingering, walk through the O'Brynes gardens. 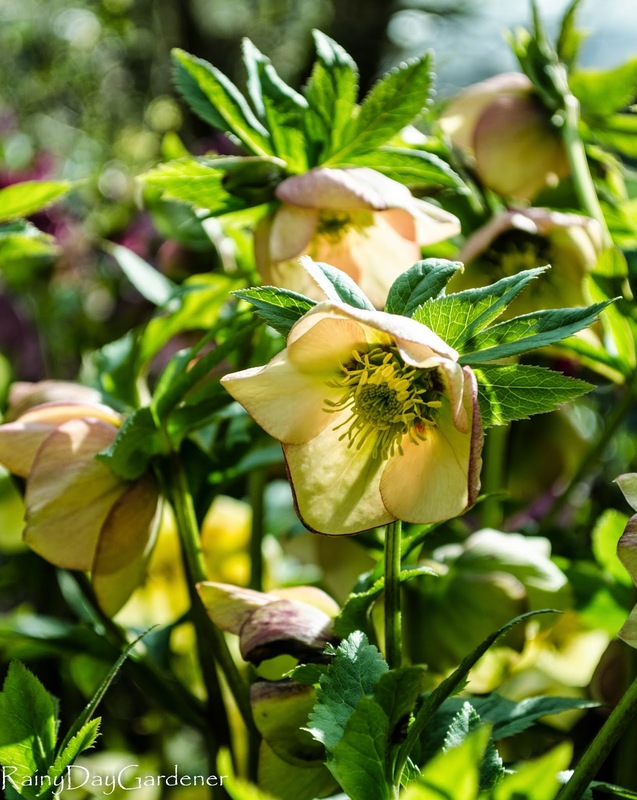 Nearly all of the hellebores were blooming with our early spring like weather, along with many companion plants such as cylamen, daffodils and emerging peonies, fennel and hyacinths. 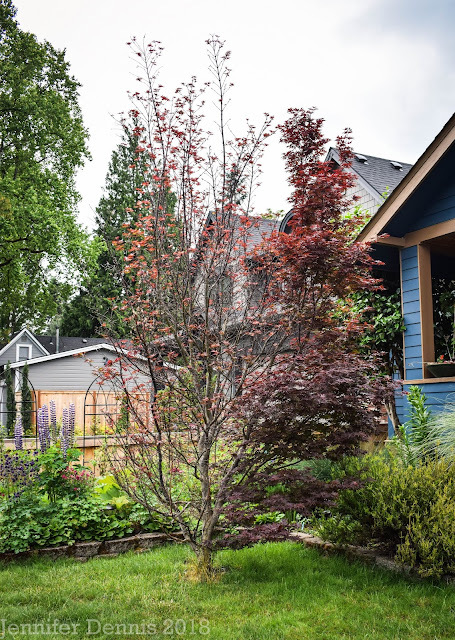 I'll share more pictures of the open gardens Tuesday. It was a delightful visit. 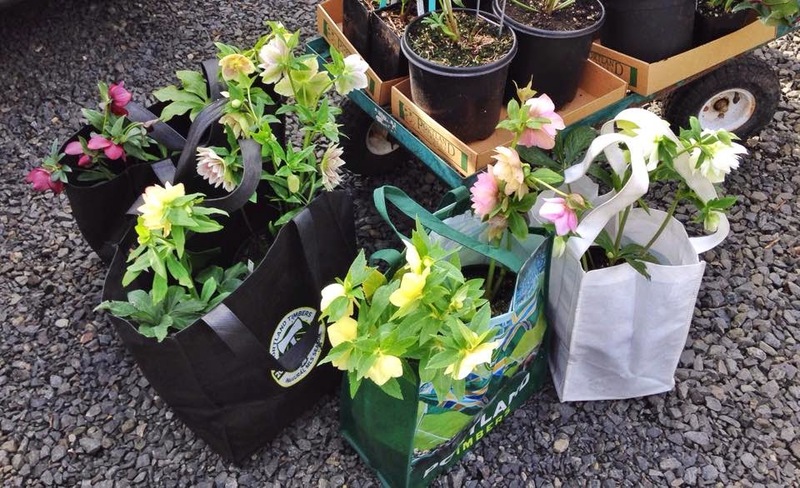 I'm pleased as punch with my hellebore loot. It was a perfect day to go plant shopping. There really is such a place as hellebore heaven. very interesting to see such a report. i never took part in such open days, afraid of the crowd and living too far away. What a crazy thing, that sale is! Kudos to you for going early and nabbing what you wanted. The prospect of a mad rush would have definitely put me off. The O'Byrne's Winter Jewels series is a very popular line of plants. It was worthwhile, but mostly because it was such fun to walk around their open gardens as well. I was surprised at the greenhouse madness but I'll admit, it added to the rush of finding our treasure. Fabulous. I love hellebores for the same reason as you, February in England tends to be grey and drab. They just seem too exotic to be flowering now. Beautiful selection of colours too. special. Nice they had open gardens too and even already daffodils in bloom, I´m seriously longing to see the first flowers of dafs here. 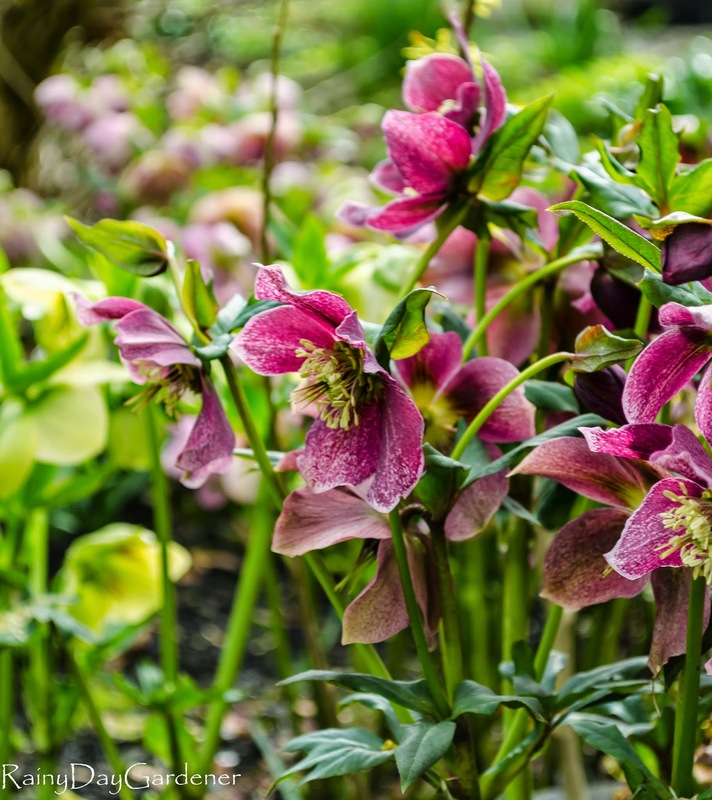 I would love to visit a Hellebore nursery in Holland! I would only be sad that I would not be able to transport them home. Thank you Jenni! 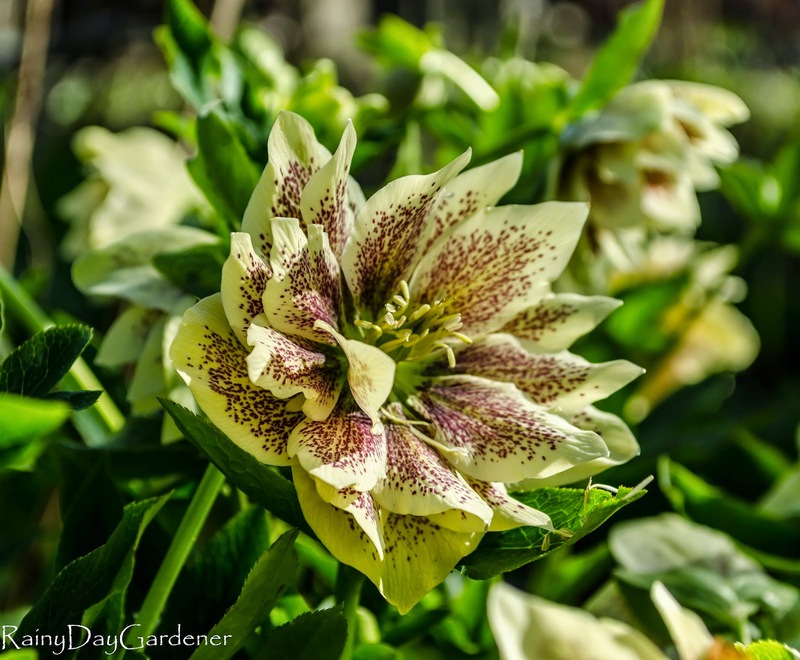 I can't call myself a huge fan of hellebore, but some varieties are absolutely gorgeous! 'Winter Jewels' is awesome! You definitely earned a gold star for that expedition. I look forward to more photos from the garden tour. It's really the companion plants that interest me. I'm so glad it worked out for you, Jennifer. I love your loot and your photos. Can you believe this weather? Honestly....NO! But, I could not have asked for a more beautiful day to enjoy and photograph the gardens. I can fully understand why you love the Hellebores so much, and I'm glad you had such a great opportunity to increase your stock. What a shame that the event is such a scrum though: you would have thought they could find a better way of doing it. Maybe they should ration the stock - "only 5 items per person" or something, in order to give more people a chance? It's really interesting, 'the frantic sale' but, I have to tell you how exhilarating it was to find some favorites in the crowds. It created quite the atmosphere. Wow, the crowd would not be fun but the gardens sound divine. Can't believe that this event is so popular that they sell out in the first hour - crazy! Glad you got such a great haul!